I have a hard time resisting the urge to add some levity in serious discussions, so along with the rich intellectual reflections underway in the Rhizomatic Learning community, I’ve been making comics. They are not frivolous works or writing, I would argue, but instead, they (hopefully) bring another angle and lens to discussions. You can make a point with comics that sometimes eludes us in writing. Sometimes, I like to grab a tweet or post from someone and rework it into a comic. Other times, I like to make my own statement. I like to think that adding a playful element from time to time opens up the floor to more people to join in, although I suspect there might be some folks who are “all in” on the serious side and sort of wish the threads remained centered on the philosophical and pedagogical underpinning of rhizomatic learning. This comic is a reaction to Tania and our RhizoRadio Play. It’s a commentary on how writing in online spaces can lead to unusual things, even a friendly text-hacking of a play that becomes a global collaboration. You just never know. A few new folks entered the Rhizomatic Learning fold this week, including my friend, Nancy, and even one of my favorite educational thinkers, Will Richardson, and they were wondering where to begin. The boat metaphor showed up in the stream of discussions. 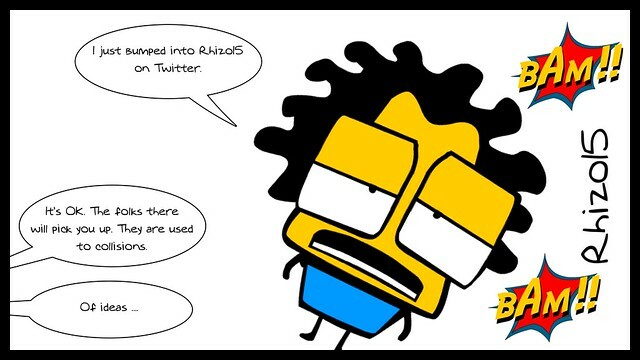 One new person wrote a tweet about “bumping” into the #rhizo15 hashtag, which I found to be funny. 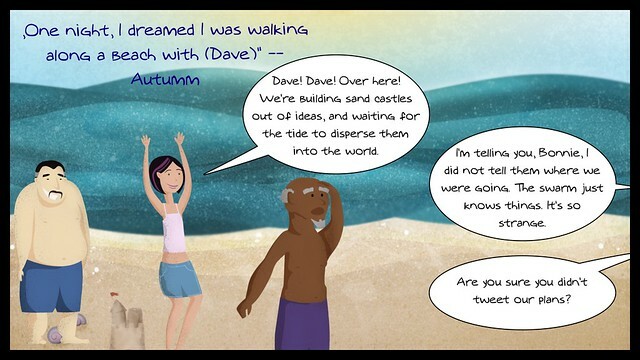 Autumm wrote a tweet about this dream of walking the beach with Rhizomatic Learning facilitator Dave. I don’t know if it a was a real dream, or if she was just having some creative fun. But I had this vision of a bunch of #rhizo15 folks building sand castles while Dave and his wife are on vacation. I wrote a review about The Next Digital Scholar collection over at Middleweb. It’s a book that has a lot of information packed tight into it, with lots of great chapters designed to help teachers think about the intersections of learning and technology. 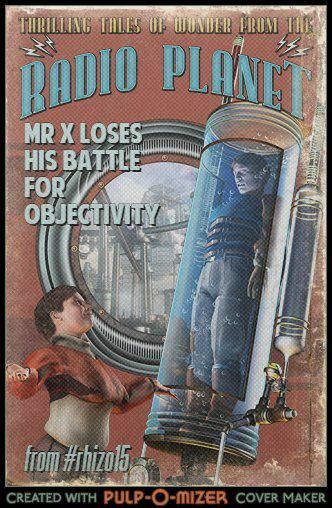 We hope you enjoy the show which we ended up titling “A Multitude of Voices: Mr X. Loses His Battle for Objectivity” … if you are on Soundcloud, please feel free to add comments as a way to annotate the play. We’re always looking for layers of involvement. Pass the popcorn and the headphones … and hit play. Terry Elliott wrote a lovely media poem about the rain, as a metaphor poem about the weight of things on the world (or, that was my interpretation). You have to read it. A piece of a line of his poem got my attention, for whatever reason. That got me writing an ancillary poem, built off that concept and riffing off his idea. I shared my response poem with Terry but first I sort of kept the poem hidden inside itself, as shape poem. I had this image of him scratching his head, trying to figure out the poem itself. A few hours later, I shared out the text of the small poem itself. This morning, I found that Terry had done a little work on my poem, removing elements to make something new. I like this PingPongpoetry concept, of one person writing and another person responding and maybe a little back and forth … all with poetry as the heart of the toss. 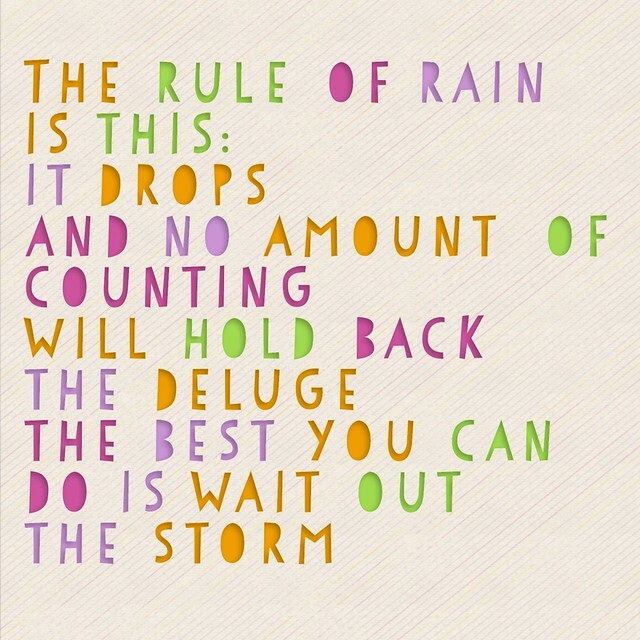 Feel free to take the rain concept another step further … share your poem out … play the writing game. If you and I were to sit in a room together — say, over a cup of coffee — I bet we could collaborate on something interesting. A story. Or a short video. Or an image. A play. A comic. Maybe even a podcast. We’d bounce ideas off each other and emerge with something interesting, if only a story to tell about what we did. We’d make something to represent our relationship as friends and colleagues and collaborators. Online communities, if nurtured, can facilitate that impulse to make things, too, and it is truly one of the main elements that has me diving into so many adventures like the current Rhizomatic Learning experience. The collaboration element is the draw for me, as it was with Connected Courses, and as it was with last year’s version of Rhizomatic Learning, and as it has been for DS106, and as it has been for the last two years of the Making Learning Connected MOOC. So, when Tania started to write a play about the subjective learning/objective experience for the first week of Rhizomatic Learning, and someone suggested her play be put into Google Docs, and then other writers (such as myself) began adding to the play, and then someone suggested this whole piece of collaborative writing be turned into a podcast radio play and then someone said maybe I could coordinate it .. I said, sure, I can do that. Collaboration is nurtured by the idea of people stepping up and saying, Sure, I can do that. Even if you are not quite aware of what you are taking on. Even in online communities, where your only interaction is often connected with a tweet, or a status update, or a blog post. If you let it happen, you quickly can build up trust among participants. And that trust allows you to take chances on something unknown. It opens the path for collaboration. 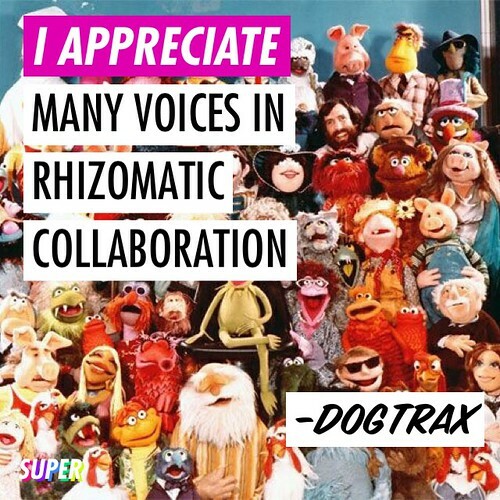 True, the complexities of online collaboration can suddenly loom quite large in this kind of undertaking where you find yourself both alone with your computing device and among many collaborators. 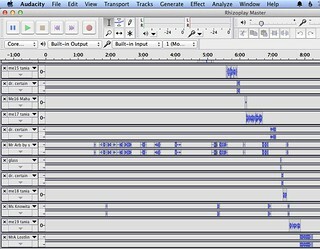 Thankfully, I was on April break from school this week, and in between family time and other commitments, I was working on pulling together dozens of audio files as people took on parts, recorded their words, and shared them online. I would then grab the audio, pull it into Audacity and try to line things up in a way that would be coherent, and weave a tapestry of voices. I was honored to be put in charge of this task, and took my role rather seriously (well, as serious as I can be) as the curator of the voices and the collective words and spirit of the play. I also realized early on how systematic I needed to be, with organizing files and with laying the voices. Otherwise, I would have slipped into file madness (it may have happened … I’m not saying). 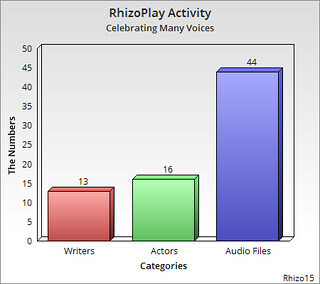 My aim as editor was to help nurture into place a radio play that we would all be proud of, no matter how large or how small a role that one participated — either as a writer, or a reader, or a commenter, or a voice actor. Cheerleader, too. The radio play will become an important artifact of content (the subject of the play) and collaboration, and the possibilities of true rhizomatic learning, in which so many roots were mingled together to produce something quite beautiful. Which is not to say the process wasn’t messy and a bit of mayhem. Sill, the many hours I spent in editing mode (and I calculated about six to eight hours of messing with audio) was time well spent. 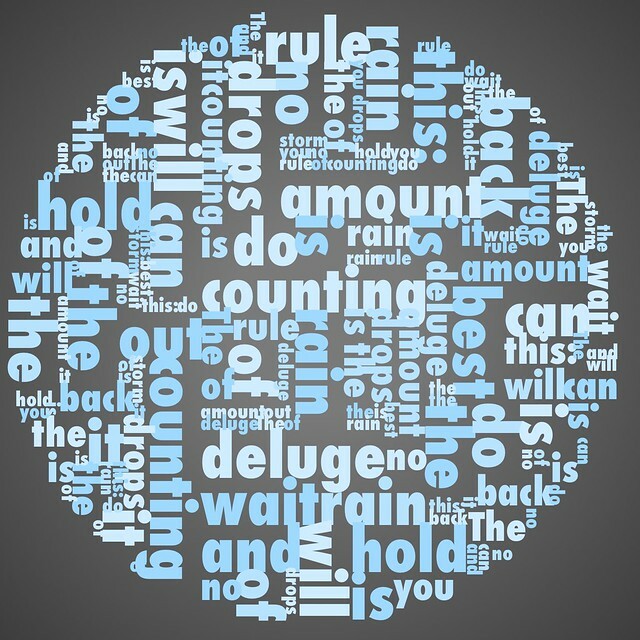 Even the music was original … from the underlying soundtrack (I created it in an app called Musyc) that I hoped would musically represent the diversity of voices and add to the tension of the interaction of characters, to the acoustic version of a song written for Rhizo15 earlier. Terry had a great song earmarked for the ending (an Arabic version of Toy Story and “You’ve Got a Friend in Me”), but I could not figure out if it would violate copyright if we used it, so we abandoned it. As I told Terry, it probably is best, as Michelle Shocked wrote in one of her songs, to make your own jam anyway. I think we will all be proud of this collaborative endeavor. There is something very powerful in “voice” and not enough of us are doing podcasting to bring that element to the surface. Here, the multitude of voices adds up to something very unique, a weaving of community that is difficult to explain. You have to hear it. You have to listen. You have to imagine. Terry had a great idea that we could not pull off: he wanted all the voice actors to gather together in a Google Hangout, and read the play live on the air, online. Then, we could strip the audio from the video, and use that as a podcast. This is where geography played against us. Too many timezones. It was a great idea that never came to fruition. 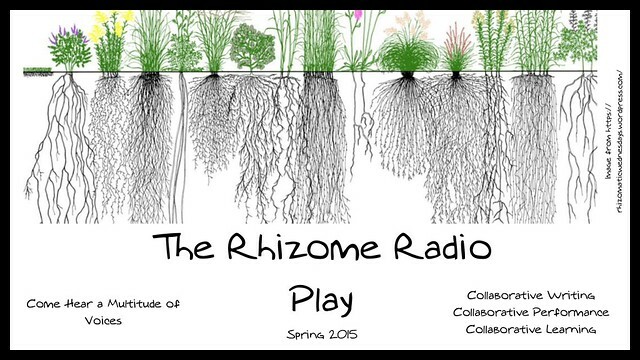 Dave Cormier, the facilitator of Rhizomatic Learning, will showcase the premiere of the radio play — A Multitude of Voices: Mr. X Loses His Battle for Objectivity — in his next post and message to the entire #rhizo15 community, probably sometime later today, or very soon (maybe even by the time you read this post). We hope you will sit back, enjoy the multitude of voices, and wonder at the collaboration. If you were one of the many who participated, then I want to extend a warm “thank you” for your contributions. It was lovely to play with our voices and our words. Until the release of the play itself, which I will embed here another day in its full glory, I have sprinkled some promotional media for the play in this blog post. A few of us were having fun making media for the virtual promotional tour in the last few days to spark interest in the play and in the nature of collaboration. Keep an eye on Dave, and …. enjoy the show. Terry introduced me to Vialogues long ago and I still return to it as an easy-entry way to interact with videos. Here, I took Dave Cormier’s video for the second week of Rhizomatic Learning, and invite others to join me in “talking back to Dave” this week. You are invited, too. In this second cycle of Rhizomatic Learning, Dave Cormier asks us to examine our notions of data and measurement, and if I read between the lines of what he wrote, we should be seeking to turn data analysis on its head. 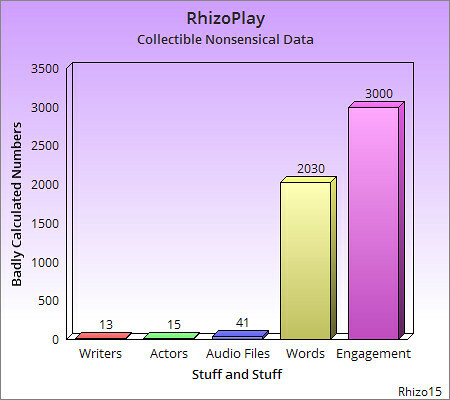 So, with that in mind, I offer up the Utterly Irrelevant Data Chart for the work that a bunch of us are doing on a collaborative RhizoRadio Play in the works …. The only category that “counts” here (in my opinion) is the last one and that is the one that I had no data on. So I made it up. I gave it a number. It looks impressive, right? The other categories are close to being true but I would not stake my house on it. 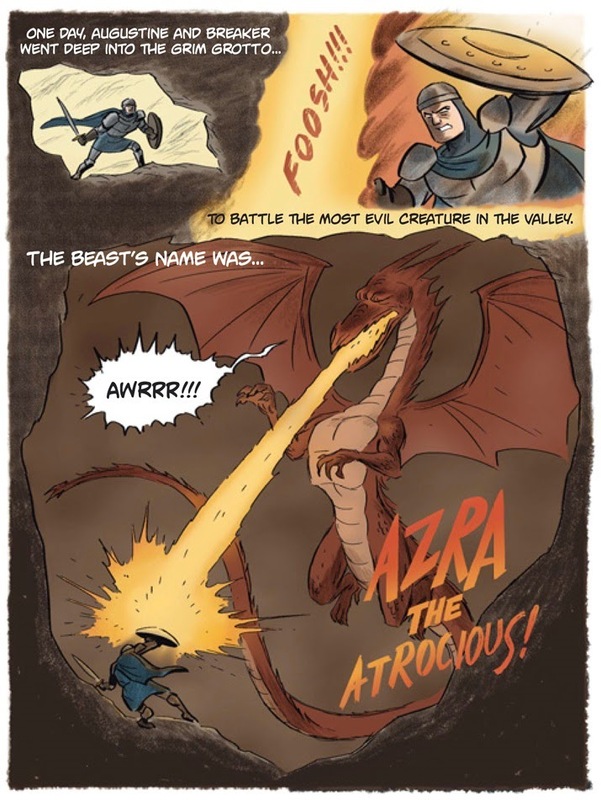 Graphic Novel Review: Dragons Beware! What sets graphic novels like Dragons Beware! (a sequel to the equally wonderful Giants Beware! from a few years ago … this graphic novel comes out next month .. I received an advance copy) is easy to identify but not so easy to pull off: strong characters, solid writing and engaging artwork. If only every graphic novel hitting the shelves for young readers consistently had those three things …. 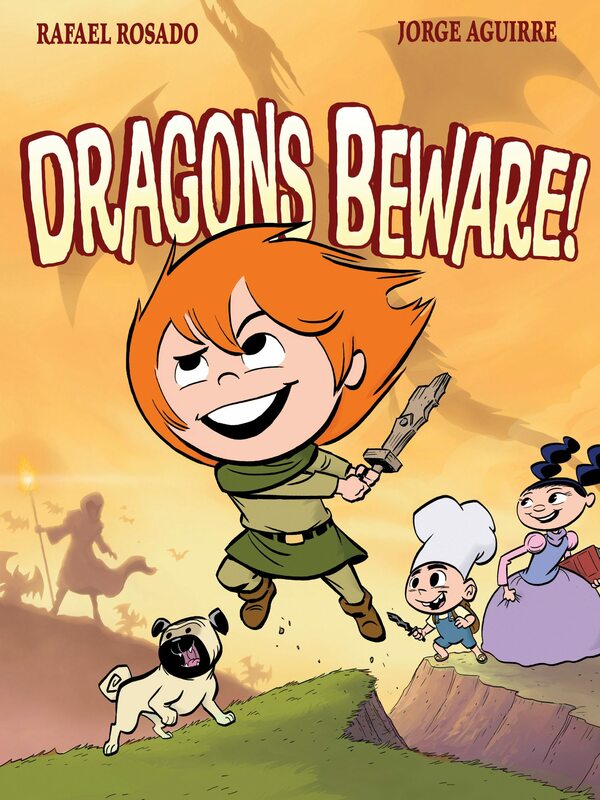 Luckily, writer Rafael Rosado and illustrator Jorge Aguirre have kept the character of the girl hero, Claudette, fearless and adventuress and in the midst of another mission, this time to secure her father’s long-lost sword — which just happens to sit inside the stomach of the most fearsome dragon in the land. Claudette, whose fully-drawn character will connect with readers of any age and any gender (even though I am happy we have a girl protagonist here), travels with her band of friends and family, including the kingdom’s princess, whose advice on solving problems through diplomatic discussions saves the day as much as Claudette’s bravery. The quality of the writing never drops here, even with the minor characters (a ragtag band of princes follows Claudette’s team and it is like watching the Little Rascals on the page), and the artwork is magnificent. The publisher, First Second, takes full use of the oversized book to bring the dragon (and its children) to full repose, extending frames across double-pages to heighten the action. Dragons Beware! will be a sure-fire hit in most elementary and even middle school classrooms, I suspect. I am hopeful a third book is in the future. Claudette and her friends deserve another adventure, and so do we. My latest post over at Middleweb documents how I took a “poem for a walk” earlier this month. You can view the article itself here, which encourages teachers to write, but also, feel free to explore my Storify portfolio, where I tried to reflect on each “move” as a writer as I did it.